Unauthorized immigrants are more likely than U.S.-born workers to be employed in industries that offer low-skilled jobs, due in part to their relatively low education levels and to limits of their status. Of all unauthorized immigrant workers, 22% are in professional, business and other services, which encompasses a wide range of businesses from legal services and advertising, to employment services, landscaping and waste management, to personal services such as dry cleaning, nail salons, car washes and religious organizations.3 Some 18% are in the leisure and hospitality sector, and 16% are in the construction industry. More than half (55%) of unauthorized immigrant workers are employed in these three sectors, compared with only 31% of U.S.-born workers. Although only 5% of unauthorized immigrant workers are employed in agriculture, that is more than double the share of U.S.-born workers (2%) who are. The 13% of unauthorized immigrant workers employed in the manufacturing industry compares with 10% of U.S.-born workers employed there. Although wholesale and retail trade employs 12% of unauthorized immigrant workers, that share is somewhat lower than for U.S.-born workers (15%). Unauthorized immigrants are far less likely than U.S.-born workers to be employed in a broad group of industries that includes education and health services, finance, information and public administration (12% vs. 37%). Although they were 5% of the overall workforce in 2012, unauthorized immigrants represent a notably higher share of workers in some industries where they are concentrated. They were 16% of employees in the agriculture industry, 12% of employees in the construction industry and 9% of employees in the leisure and hospitality industry. 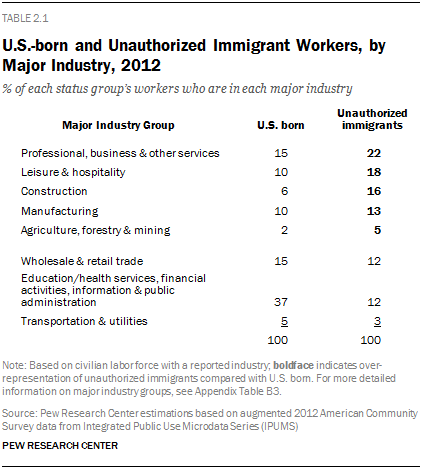 Unauthorized immigrants are particularly concentrated in some subsets of each major industry. In 2012, they represented 24% of workers in the landscaping industry, 23% of those in private household employment, 20% of those in apparel manufacturing, 20% in crop production, 19% in the dry cleaning and laundry industry and 19% of those in building maintenance. See the appendix for tables on unauthorized immigrants by major industries (Table B3) and detailed industries (Table B4). In a change from an earlier pattern of sharp increase, the number of unauthorized immigrants working in the construction sector and manufacturing industry fell from 2007 to2012. The number of unauthorized immigrant workers in the construction industry declined, to 1.3 million in 2012 from 1.6 million in 2007, after rising from about 350,000 in 1995. Total U.S. construction industry employment also fell from 2007 to 2012, though at a slower rate than among unauthorized immigrants (16% vs. 24% decrease). As was the story in construction jobs, the construction industry had a decline in the share of its workforce consisting of unauthorized immigrants, to 12% in 2012 from 14% in 2007. The share was only 4% in 1995. The number of unauthorized immigrants working in the manufacturing industry declined, to 1 million in 2012 from 1.1 million in 2007 (an 8% decrease), after rising from about 775,000 in 1995. The industry’s overall employment also declined, by 5%, from 2007 to 2012. Unauthorized immigrants made up 6% of the manufacturing industry workforce in 2012, statistically unchanged from 2007. The share was 4% in 1995. Looked at another way—using the unauthorized immigrant share of each industry’s workforce—the picture of industry concentration changes somewhat. In almost half of the states (21 of 43), agriculture is the industry with the largest share of total workers who are unauthorized immigrants; in 10 other states, agriculture is the industry with the second largest share of workers who are unauthorized immigrants. These 31 states are spread across all regions of the country. The agriculture industry ranks first in this regard in every Western state for which data are available, except Alaska and Nevada; in Nevada, it ranks second, behind construction.